In his bestselling book “Outliers” Malcolm Gladwell came out with a convincing theory of why people born in 1954 – 55 ruled the Tech world. Bill Gates, Steve Jobs, Bill Joy, Scott McNealy, Eric Schmidt, James Goslings and many more famous astrophysicists and scientists were born in that period. What you hear as a child sticks to your mind and I recollect my mother being disappointed that none of her children were born in November. She had the view that those born in November had an edge and would become famous. Maybe this was driven by her loyalty to the Nehru family (Both Jawaharlal & Indira Gandhi are Nov born). Having seen many a famous personalities Birthday celebrations popping up in news and social media over the last few weeks I decided to do some research. And yes – there does some seem to be some strong connect between being born in Nov and being famous. Here is a list I was able to collate in 15 minutes and its real impressive. I think my mothers intuition was right. What I can infer from this dipstick is a large number of Film Stars and Politicians are born in Nov while there are few Corporate Czars and world beating sports personalities. 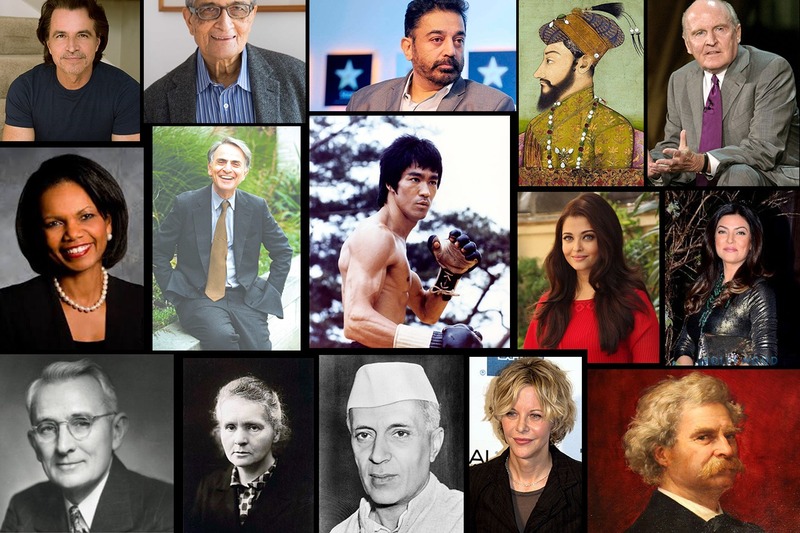 A lot of film stars and media personalities – Bruce Lee, Demi Moore, Sharukh Khan, Meg Ryan, Kamlahasan, Juhi Chawla, Irrfan Khan, Sushmita Sen, Aishwariya Rai, Tabu, Whoopi Goldberg, Larry King, Zeenat Aman and Bryan Adams are all Nov born. So are Nobel Price winners like C.V.Raman, Marie Curie, Amartya Sen and Winston Churchill. And rulers & politicians like Jawaharlal Nehru, Abul Kalam Azad, Indira Gandhi, L.K.Advani, Mulayam Singh Yadav, Aurangazeb, Rani Lakshmibai, Tipu Sultan, Arjun Singh , Kamal Nath, Condolessa Rice and Imran Khan.The list also includes the legendary corporate leader Jack Welsh who in his undisputed role as head of GE was both a sultan and a politician. A few players Virat Kohli, Billie Jean King, V.V.S.Laxman. Famous writers like Dale Carnegie, R.L.Stevenson, Jonathan Swift and Mark Twain. Spiritual leaders Sri M & Sathya Sai Baba. Those born in the month of November either fall under the zodiac sign of Scorpio or are born on the Scorpio-Sagittarius cusp. As per Linda Godman those under the influence of Scorpio are easily approachable and are blessed with a sharp mind. These individuals are known for their forward thinking and are always full of unique and extraordinary ideas. These people are also known for their strong sense of clairvoyance and can at times be secretive in nature. Though not known for being talkative, they are extremely affable and make a lot of friends. Often they may appear as withdrawn and solitary, but they always keep a keen eye on the happening in their surrounding and are hardly apathetic. However, on the other side they can often be extremely manipulative, obsessive and revengeful. They are very loving and caring to their partners and exhibit a great deal of passion in their relationships, but one of their negative traits is that they can be a little jealous at times. A famous Numerologist reports that if you were born in November, the number 11, which is a higher vibration of 2, will be of great importance to you. You are psychic, empathic, and positive. However, sometimes you get overwhelmed by your own sensitivity and develop stress related health and psychological problems, such as chronic fatigue and depression. You often set an example for others and make a great teacher. A popular joke doing the rounds on Nov 14th is that its exactly 9 months after Valentines Day. I wonder if that has any impact on the greatness of the Nov born?